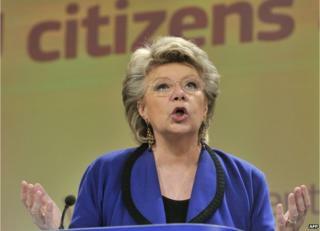 The EU Justice Commissioner, Viviane Reding, says it is important for British voters to see accurate "facts and figures on the table" about the EU before May's European elections. "Very often I see a completely distorted truth being presented," she told a public gathering in London, and urged more British debate about Europe. She was speaking to voters at a "citizens' dialogue" - part of an official EU information campaign. The debates are being held EU-wide. There is a general expectation that the Eurosceptic UK Independence Party (UKIP) will poll strongly in May, possibly coming top overall. Currently UKIP has nine of the UK's 73 seats in the European Parliament. The party sees the EU as a waste of taxpayers' money and wants Britain to pull out of the 28-member bloc. Ms Reding, a veteran conservative politician from Luxembourg, said there was a need for more information about the EU, not only in the UK but in other member states too. She said Brussels had even been blamed for Britain's floods. "I didn't know I'm so powerful that I can make the rain fall," she quipped. She said there was little awareness that "the most powerful parliament in Europe is the European Parliament - because it is co-decider with the member states on EU laws. "Seventy per cent of the laws in this country are co-decided with the European Parliament." A pro-EU lobby group, British Influence, later said Ms Reding's 70% figure was "simply not true". "A non-partisan, rigorously independent analysis of UK laws by the House of Commons Library found that between 8 and 14% of Britain's laws are made in the EU," said the group's director Peter Wilding. Since the Lisbon Treaty was adopted in 2009, MEPs have become directly involved in nearly all EU policy areas. But only the Commission can initiate legislation. Tax, defence and foreign policy are largely outside the MEPs' remit, and they have little influence over national spending on public services such as health and education. Speaking at the same forum, UK Europe Minister David Lidington said increasing the European Parliament's powers was not the way to get more public engagement in EU affairs. He called for UK politicians and civil servants to do more detailed scrutiny of EU laws, including assessing the impact of certain EU measures retrospectively. Europe's "democratic deficit" was exacerbated by "talk about institutions, jargon", he said. Instead, the EU should focus on issues that really matter to voters, such as mobile roaming charges, budget flights, creating much-needed jobs, he said. A questioner in the debate pointed out that the big influx of East Europeans to the UK in recent years had created tensions over jobs. Opinion polls suggest that immigration is high on the list of UK voters' concerns. Ms Reding said statistics showed that the majority of EU migrants in the UK "came to work, they're net contributors". "A small minority creates real difficulties, and very often they are sitting in one spot," she added. She quoted new official UK figures which show that about 2.2 million Britons live in continental Europe and about 2.3 million citizens of other EU countries live in the UK. In the UK, 77% of the EU migrants work, while the comparable figure for Britons is 72% and for non-EU migrants it is 60%, Ms Reding said. EU migrants make up just 2.1% of welfare recipients in the UK, she added.